It's Christmas Eve. Everyone should be opening the last of their advent calendars... I've been following and enjoying MisaQa's "Mythical Creatures" advent calendar... this is the third year I've followed MisaQa and look forward to it every year. And speaking of advent calendars, I saw on BrickSet's RSS feed today that there will be a #6299 Pirate Advent Calendar next year??? Let's just hope LEGO doesn't screw it up next year and not ship them to the US like they did with the #7979 Castle Advent Calendar! I bought my two and I'm jonesing for another one. 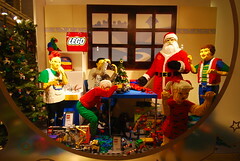 Was surfing around Flickr looking for something to blog about and stumbled across this Christmas LEGO display. I really wish I knew some of the history behind it -- I don't think I've seen anything on this scale in the US, except the there's a similar LEGO Santa at the Orlando LIC... And I'm starting to wonder what they'll do with the LEGO Santa after the holidays (put it in storage, ship it back to HQ, or something else).